Many genetic and environmental conditions can interfere with the normal development of primary teeth and can manifest as defects in the enamel. Such defects can be associated with pain and discomfort and can have esthetic implications which may affect the young child’s self-esteem. It is not only important for clinicians to be able to diagnose the defects but also to understand the implications these might have on restorative techniques and materials they choose. Restorative management can be challenging because of the limited cooperation in some children, the extent of the defects, and the sensitivity that may be present. The main aims of treatment should be to alleviate pain and sensitivity, improve esthetics, and manage any other concerns that the child or the parents might have. This should be followed by consideration of long-term treatment planning involving progression of the primary through to the mixed dentition. In many cases, especially where there is a genetic component with generalized involvement of both the primary and subsequent permanent teeth, an interdisciplinary approach to management is appropriate. Finally it is important to be able to provide treatment in a manner the child finds acceptable. 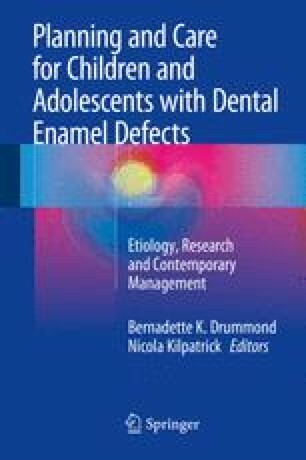 This chapter helps the reader identify and effectively manage primary teeth with commonly encountered enamel defects.